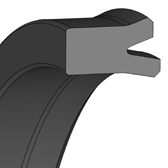 The KNA 23 u-ring is a single-acting piston seal with an asymmetrical design. Due to the recessed outer sealing lip, the prestress is directed outwards in order to increase the sealing effect even at low pressure. Apart from its application in hydraulics, this design can also be used for pneumatic applications. 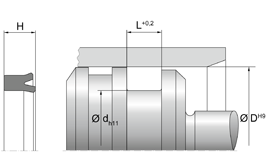 U-rings made of NBR are particularly suitable for use at low pressures. The standard KNA 23 design is provided with 90 Sh-A hardness. For special applications, we can offer different materials and hardness levels.